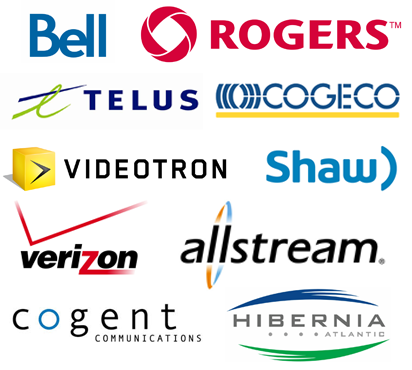 Netrium is a facilities-based Carrier aggregator and network provider that joins or “glues” the Carrier networks together at multiple, redundant data-centre locations across Canada. We make the network easy for you, by managing, monitoring, and customizing the Carrier services for your requirements. 100% network uptime with multi-Carrier redundancy and automatic fail-over. Built-in QoS priority for your voice traffic and other critical applications without additional fees. Dedicated bandwidth up to GigE and 10 Gbps. Customized configurations to optimize your network routing, redundancy, and bandwidth for MPLS applications, Layer-2 replication, and Internet access. Mix and match multiple Carriers into a redundant, best-of-breed MPLS network for your requirements. 24/7 pro-active monitoring and support with fast response times and detailed network reports. We customize, manage, and monitor the Carriers for you, so that you can focus on your core services. Lower costs than dealing directly with the large Carriers by approximately 30% - 50%.